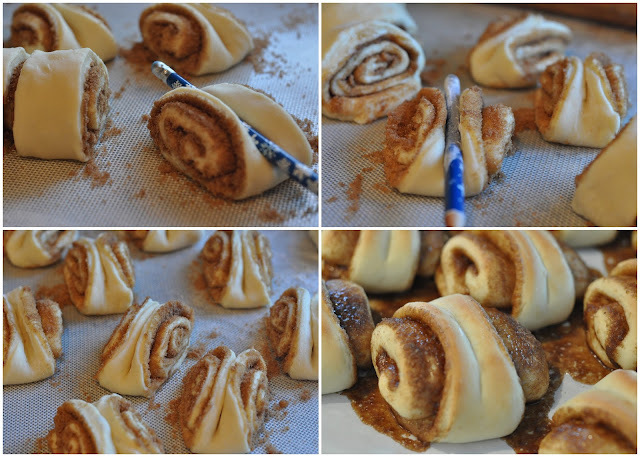 For this Flashback Friday I want to remind you of these cinnamon rolls posted in 2009 - the name referring to the way the roll stands up and spreads out like it has wings. It's a small recipe (yields 24 - 30) and really doesn't take long to do because you skip the first rising. This is another recipe passed down from my mom. In large bowl of stand mixer, beat eggs and sugar well. Add buttermilk, salt and water. Mix 2 c of the flour with baking powder and yeast, then stir into liquid mixture. Divide dough in half. Sprinkle rolling surface with flour. Shape and pat dough into a rectangular shape before rolling each half into a 10" x 20" rectangle, dusting with flour when needed. Spread with melted butter, then brown sugar mixture. Roll up jelly-roll style, starting on long side. Slice into 1 1/2 inch slices. While slice is “standing up”, indent it almost all the way through with a pencil (dipped in flour) or spatula as though you’re slicing it in half again . . . this makes the sides pop up like wings. Place on parchment paper lined cookie sheets. If you don’t use parchment paper, grease the pans and remove rolls as soon as you take them out of the oven, before sugar hardens. Cover loosely with tea towel and plastic. Rise 1 - 1 1/2 hours. Some buns will kind of lose their shape while rising and I sometimes (gently) re-indent them. Bake at 350 F, 15 minutes or until golden. Drizzle with a thin icing. ( approx 1 1/2 cups icing sugar, 2 Tbsp. softened butter and milk - until desired spreading consistency) I like to use a teaspoon or butter knife and just kind of ‘scatter’ the icing. These rolls freeze well in sealed container. Reheat to serve warm. Oh my goodness, they sound delicious? You know what I will be making this weekend. Oh these look so delicious. The Finnish word for cinnamon rolls is 'Korvapuusti' meaning literally a slap on the ear. Funny isn't it! I don't know the origin of this pet name... Happy Sunday! I made these on Tuesday night to take to school on Wednesday. There were only 15 of us, but we managed to eat all 32 that the batch made with none left over! Delicious!